1. A long purple jacket with attached vest, printed shirt with printed tie design and waistcoat. 2. A 3/4 vinyl mask. 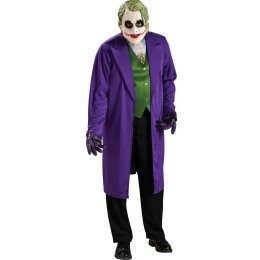 Note: Joker wig, face paint kit, gloves and trousers are not included with this costume.